I have four brothers. No sisters. Although I have a host of female cousins who I have claimed as sisters. I grew up with three of my brothers: Terry, Michael, and Dontae. I didn't meet Derrick until I was in college. He's my brother from another mother. A couple of years ago, Derrick requested that I make him a hat and scarf set. So, I made him the Irish Hiking Scarf along with the Irish Hiking Hat that I designed to go with it. He loved and appreciated that set, and I really loved making it for him. 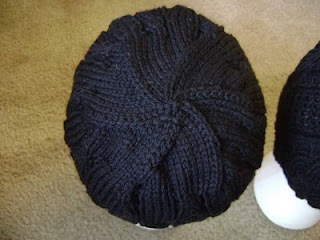 During the 2008 X-mas season, it dawned on me that I'd never knit anything for Terry, Michael, and Dontae. So,I decided to design hats for each of them for Christmas presents. They live in Minnesota so I KNEW they'd appreciate a warm wool hat. I gave Terry his hat on X-mas day...the other two couldn't make it to my mom's house in Chicago. I hate that I didn't take a picture of his hat before I left. Since the other two weren't there, I took advantage of the extra time I had to finish their hats. "The Dontae" is on the left; "The Michael" is on the right. Both hats have the swirl design in the crown.